Many have been talking about the FAA’s drone sightings reports. We have constantly seen in the news the reports. Others in the industry cite the drone sightings as evidence of the greater need for the government(s) to do something by creating regulations. Some counter-drone companies have used it to show a need for their product. Regardless of where you come from in the industry and your motives, we need to accurately understand the drone sightings data. Update: UAS Weekly reported, “Unmanned Aircraft Safety Team (UAST) Drone Sightings Working Group released a new report on the Federal Aviation Administration’s (FAA) 3,714 drone sightings reports collected by flight crews, air traffic controllers and citizens from November 2015 to March 2017. The report found that only a small percentage of drone reports pose a safety risk, while the vast majority are simply sightings.” Report is located here. The FAA has inaccurately reported the drone sightings data they have published. There are more drone sightings in populated areas. There are more drone sightings in warmer months than colder. States with larger populations have more drone sightings. The drone sightings over time are steadily growing. Any discussions we have on this topic should be using numbers and not percentages or words. Basically, population and weather/climate are the determining factors of when and where you’ll have drone sightings. Michael Huerta, the head of the FAA, said at Interdrone in September 2107, “We’re receiving an average of about 200 drone-sighting reports from pilots each month this year.” This is not accurate. 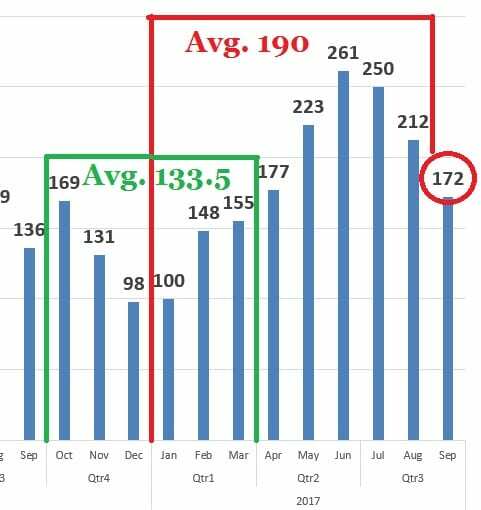 The average for the year through August was 190. Notice that Huerta mentioned the number at the tail end of the cycle. See the graph. If he would have made the statement the next month in October, the average would have been 188.6. The average would have continued to decrease for the next so many months. Why did they not use the 6 month average from October to March which was 133.5? On 10/12/2017, the FAA requested information collection review from OIRA to collect information for their LAANC system. The FAA said, “Today there are an average of 250 safety reports a month, or approximately 1,500 over a six-month period, associated with a potential risk of an incident between manned aircraft and a UAS.” The big problem with this was the average is NOT 250! In the preceding 6 months, the total (1,295) was LESS than 1,500 and will be LESS than 1,500 in the upcoming 6 months based on previous data trends. In other words, this information was completely wrong. The average and the 6 month total were both completely wrong. The FAA has done a very poor job on giving access to the data. One would think it was intentionally created in such a way as to not be easily searchable. Before you read my points below, compare it to the FAA’s Aviation Safety Information Analysis and Sharing portal. Just search around a little bit and you’ll see how just in-depth and detailed the data is. You’ll also notice that it is very searchable. Just compare these two screenshots to see what I mean. I’ll give you some examples of why I say the data is hard to work with (if not intentionally designed to be that way). The quarters do not have consistent formats which means you have to rearrange things. You’re going to have to do copy and pasting and use the left, right, or mid extraction function a bunch. Even that doesn’t work so well because of the terms and format change. A whole quarter has an apostrophe in front of EVERY date which prevents you from sorting and totaling by date unless you remove it. The data in the preliminary reports are all in one chunk for each line so you have to use more advanced Excel extraction formulas to extract the text which prevents lay people from analyzing the data. The dates have times included in the dates which create more problems for sorting. The time isn’t extracted to its own column. You have to use the text to column function to fix this. The FAA CAN create a drone enforcement database. They are already doing this with others under the FAA’s jurisdiction. 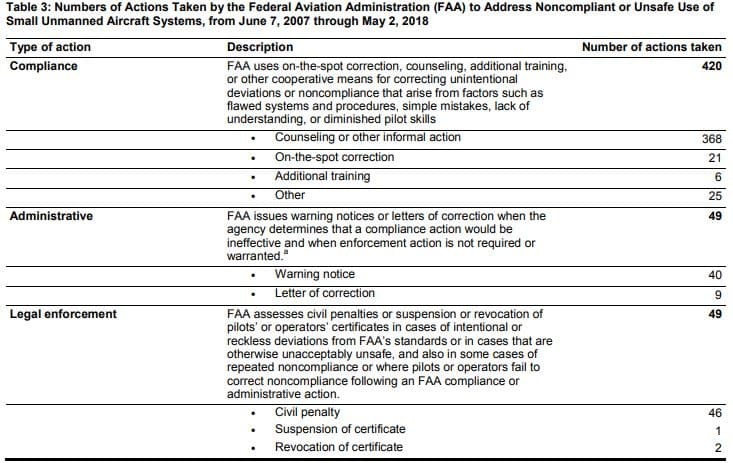 See the FAA’s enforcement action reports. 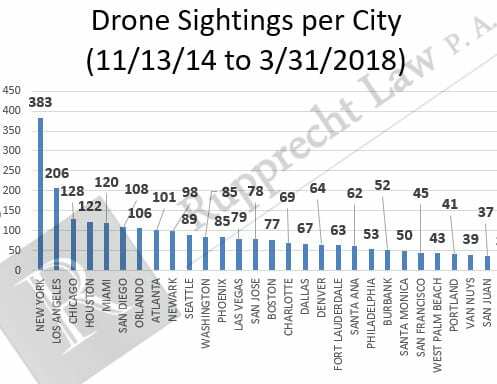 Compare those enforcement reports to the drone sightings data and you’ll see once again the drone sightings data is just poorly put together. Why is it that the Academy of Model Aeronautics and I have published material on this and not the FAA? These totals and graphs are based on data from 11/13/14 to 3/31/2018. Drone Operators: If you are operating near large populations, during the day, or during warmer months, you have a greater chance of having problems with local law enforcement misidentifying you as the other reckless crazy guy flying. Additionally, if you live near a large population that has a warm climate, you have a greater chance of having more state drone laws and/or local laws being created to counter the more numerous drone sightings. Manned Pilots: Drones typically fly around populated areas during warm weather. Take this into account when doing safety risk management. 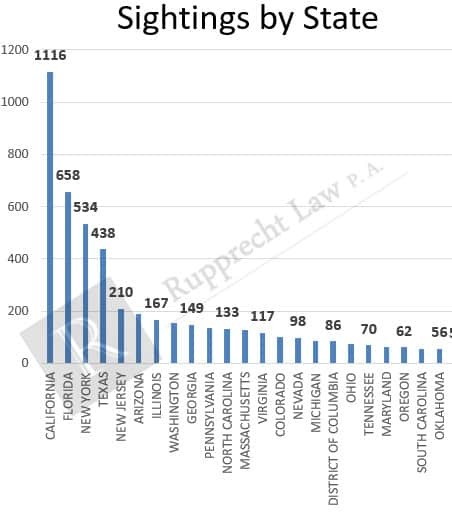 Cities & States: If you don’t have that much of a population, you should think twice about creating a drone law as it will impact businesses greater than it will benefit the public which is small. 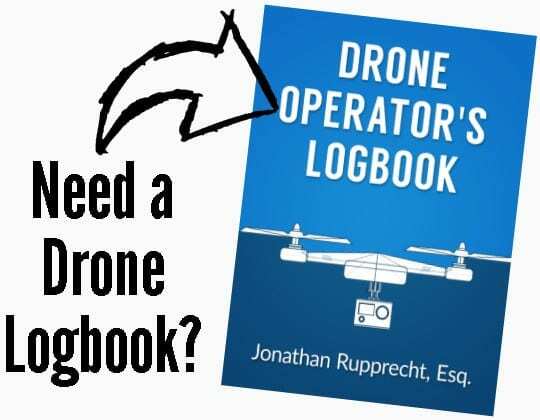 Conversely, if you are a large city or heavily populated state, you should seriously consider figuring out a legal game plan for dealing with the drones. FAA is doing its pilot program to work with local governments to create state and local drone laws. There are issues with that. See that article for more details. Start publishing the enforcement actions against illegal and unsafe operators. Start doing more enforcement actions against the illegal and unsafe operators which are all over the internet. Yes, I know it might be hard to find SOME of the bad actors but you literally have, not fruit, but fruit gift baskets laying on the ground of people you can go after right now. Change your enforcement philosophy so you aren’t so relaxed with drone operators. The common feeling in the drone community is you get one free stupid stunt and THEN the FAA might come after it you. Meanwhile, all the LAWFUL operators are losing business or having to deal with state and local regulations being created because of the FAA’s inactivity. The FAA is not pro-business. Consistent inactivity hurts the drone industry and businesses. (1) ARCTIC.—The term ‘‘Arctic’’ means the United States zone of the Chukchi Sea, Beaufort Sea, and Bering Sea north of the Aleutian chain. (2) CERTIFICATE OF WAIVER; CERTIFICATE OF AUTHORIZATION.—The terms ‘‘certificate of waiver’’ and ‘‘certificate of authorization’’ mean a Federal Aviation Administration grant of approval for a specific flight operation. (3) PERMANENT AREAS.—The term ‘‘permanent areas’’ means areas on land or water that provide for launch, recovery, and operation of small unmanned aircraft. (4) PUBLIC UNMANNED AIRCRAFT SYSTEM.—The term ‘‘public unmanned aircraft system’’ means an unmanned aircraft system that meets the qualifications and conditions required for operation of a public aircraft (as defined in section 40102 of title 49, United States Code). (5) SENSE AND AVOID CAPABILITY.—The term ‘‘sense and avoid capability’’ means the capability of an unmanned aircraft to remain a safe distance from and to avoid collisions with other airborne aircraft. (6) SMALL UNMANNED AIRCRAFT.—The term ‘‘small unmanned aircraft’’ means an unmanned aircraft weighing less than 55 pounds. (7) TEST RANGE.—The term ‘‘test range’’ means a defined geographic area where research and development are conducted. (8) UNMANNED AIRCRAFT.—The term ‘‘unmanned aircraft’’ means an aircraft that is operated without the possibility of direct human intervention from within or on the aircraft. (9) UNMANNED AIRCRAFT SYSTEM.—The term ‘‘unmanned aircraft system’’ means an unmanned aircraft and associated elements (including communication links and the components that control the unmanned aircraft) that are required for the pilot in command to operate safely and efficiently in the national airspace system. (1) COMPREHENSIVE PLAN.—Not later than 270 days after the date of enactment of this Act, the Secretary of Transportation, in consultation with representatives of the aviation industry, Federal agencies that employ unmanned aircraft systems technology in the national airspace system, and the unmanned aircraft systems industry, shall develop a comprehensive plan to safely accelerate the integration of civil unmanned aircraft systems into the national airspace system. (I) incorporation of the plan into the annual NextGen Implementation Plan document (or any successor document) of the Federal Aviation Administration. (3) DEADLINE.—The plan required under paragraph (1) shall provide for the safe integration of civil unmanned aircraft systems into the national airspace system as soon as practicable, but not later than September 30, 2015. (4) REPORT TO CONGRESS.—Not later than 1 year after the date of enactment of this Act, the Secretary shall submit to Congress a copy of the plan required under paragraph (1). (5) ROADMAP.—Not later than 1 year after the date of enactment of this Act, the Secretary shall approve and make available in print and on the Administration’s Internet Web site a 5-year roadmap for the introduction of civil unmanned aircraft systems into the national airspace system, as coordinated by the Unmanned Aircraft Program Office of the Administration. The Secretary shall update the roadmap annually. (3) an update to the Administration’s most recent policy statement on unmanned aircraft systems, contained in Docket No. FAA–2006–25714. (1) ESTABLISHMENT.—Not later than 180 days after the date of enactment of this Act, the Administrator shall establish a program to integrate unmanned aircraft systems into the national airspace system at 6 test ranges. The program shall terminate 5 years after the date of enactment of this Act. (F) provide for verification of the safety of unmanned aircraft systems and related navigation procedures before integration into the national airspace system. (C) consult with the National Aeronautics and Space Administration and the Department of Defense. (4) TEST RANGE OPERATION.—A project at a test range shall be operational not later than 180 days after the date on which the project is established. (A) IN GENERAL.—Not later than 90 days after the date of the termination of the program under paragraph (1), the Administrator shall submit to the Committee on Commerce, Science, and Transportation of the Senate and the Committee on Transportation and Infrastructure and the Committee on Science, Space, and Technology of the House of Representatives a report setting forth the Administrator’s findings and conclusions concerning the projects. (ii) to validate the sense and avoid capability and operation of unmanned aircraft systems. (1) IN GENERAL.—Not later than 180 days after the date of enactment of this Act, the Secretary shall develop a plan and initiate a process to work with relevant Federal agencies and national and international communities to designate permanent areas in the Arctic where small unmanned aircraft may operate 24 hours per day for research and commercial purposes. The plan for operations in these permanent areas shall include the development of processes to facilitate the safe operation of unmanned aircraft beyond line of sight. Such areas shall enable over-water flights from the surface to at least 2,000 feet in altitude, with ingress and egress routes from selected coastal launch sites. (2) AGREEMENTS.—To implement the plan under paragraph (1), the Secretary may enter into an agreement with relevant national and international communities. (3) AIRCRAFT APPROVAL.—Not later than 1 year after the entry into force of an agreement necessary to effectuate the purposes of this subsection, the Secretary shall work with relevant national and international communities to establish and implement a process, or may apply an applicable process already established, for approving the use of unmanned aircraft in the designated permanent areas in the Arctic without regard to whether an unmanned aircraft is used as a public aircraft, a civil aircraft, or a model aircraft. SEC. 333. SPECIAL RULES FOR CERTAIN UNMANNED AIRCRAFT SYSTEMS. (a) IN GENERAL.—Notwithstanding any other requirement of this subtitle, and not later than 180 days after the date of enactment of this Act, the Secretary of Transportation shall determine if certain unmanned aircraft systems may operate safely in the national airspace system before completion of the plan and rulemaking required by section 332 of this Act or the guidance required by section 334 of this Act. (2) whether a certificate of waiver, certificate of authorization, or airworthiness certification under section 44704 of title 49, United States Code, is required for the operation of unmanned aircraft systems identified under paragraph (1). (c) REQUIREMENTS FOR SAFE OPERATION.—If the Secretary determines under this section that certain unmanned aircraft systems may operate safely in the national airspace system, the Secretary shall establish requirements for the safe operation of such aircraft systems in the national airspace system. SEC. 334. PUBLIC UNMANNED AIRCRAFT SYSTEMS. (4) provide guidance on a public entity’s responsibility when operating an unmanned aircraft without a civil airworthiness certificate issued by the Administration. (b) STANDARDS FOR OPERATION AND CERTIFICATION.—Not later than December 31, 2015, the Administrator shall develop and implement operational and certification requirements for the operation of public unmanned aircraft systems in the national airspace system. (1) IN GENERAL.—Not later than 90 days after the date of enactment of this Act, the Secretary shall enter into agreements with appropriate government agencies to simplify the process for issuing certificates of waiver or authorization with respect to applications seeking authorization to operate public unmanned aircraft systems in the national airspace system. (v) outside of 5 statute miles from any airport, heliport, seaplane base, spaceport, or other location with aviation activities. The Administrator of the Federal Aviation Administration shall carry out all safety studies necessary to support the integration of unmanned aircraft systems into the national airspace system. (5) when flown within 5 miles of an airport, the operator of the aircraft provides the airport operator and the airport air traffic control tower (when an air traffic facility is located at the airport) with prior notice of the operation (model aircraft operators flying from a permanent location within 5 miles of an airport should establish a mutually-agreed upon operating procedure with the airport operator and the airport air traffic control tower (when an air traffic facility is located at the airport)). (b) STATUTORY CONSTRUCTION.—Nothing in this section shall be construed to limit the authority of the Administrator to pursue enforcement action against persons operating model aircraft who endanger the safety of the national airspace system. 107.5 Falsification, reproduction or alteration. Take me back to the Drone Regulations Directory. § 107.5 Falsification, reproduction or alteration. (1) Any fraudulent or intentionally false record or report that is required to be made, kept, or used to show compliance with any requirement under this part. (2) Any reproduction or alteration, for fraudulent purpose, of any certificate, rating, authorization, record or report under this part. Paragraph (a) applies to remote pilots as well as NON-remote pilots. An act in (a) can be punished by (1)-(3). (3) is especially useful in situations where the person does not have a remote pilot certificate and does not have any intentions of obtaining one. Currently, the U.S. criminal code prohibits fraud and falsification in matters within the jurisdiction of the executive branch. 18 U.S.C. Section 1001.The FAA too may impose civil sanctions in instances of fraud and falsification in matters within its jurisdiction. The FAA has exercised this power in 14 CFR 61.59, 67.403, 121.9, and 139.115, which currently impose civil prohibitions on fraud and false statements made in matters within the FAA’s jurisdiction. The NPRM proposed to prohibit a person from making a fraudulent or intentionally false record or report that is required for compliance with the provisions of part 107. The NPRM also proposed to prohibit a person from making any reproduction or alteration, for a fraudulent purpose, of any certificate, rating, authorization, record, or report that is made pursuant to part 107. Finally, the NPRM proposed to specify that the commission of a fraudulent or intentionally false act in violation of § 107.5(a) could result in the denial, suspension, or revocation of a certificate or waiver issued by the FAA pursuant to this proposed rule. For the reasons discussed below, this rule will finalize these provisions as proposed with some minor revisions for clarification purposes. Three organizations and one individual commented on the proposal to prohibit fraud and false statements, and all of those commenters generally supported the proposal. For example, the Small UAV Coalition stated that they support the FAA’s proposal to prohibit intentionally false or fraudulent documents used to show compliance with part 107, and added that such false or fraudulent records or reports warrant enforcement action. One individual supported “heavy fines or jail” for those providing false information. Two commenters, the University of North Dakota’s John D. Odegard School of Aerospace Sciences and the Institute of Makers of Explosives, requested clarification as to the penalties that could be imposed for violating the prohibition on fraud and false statements. 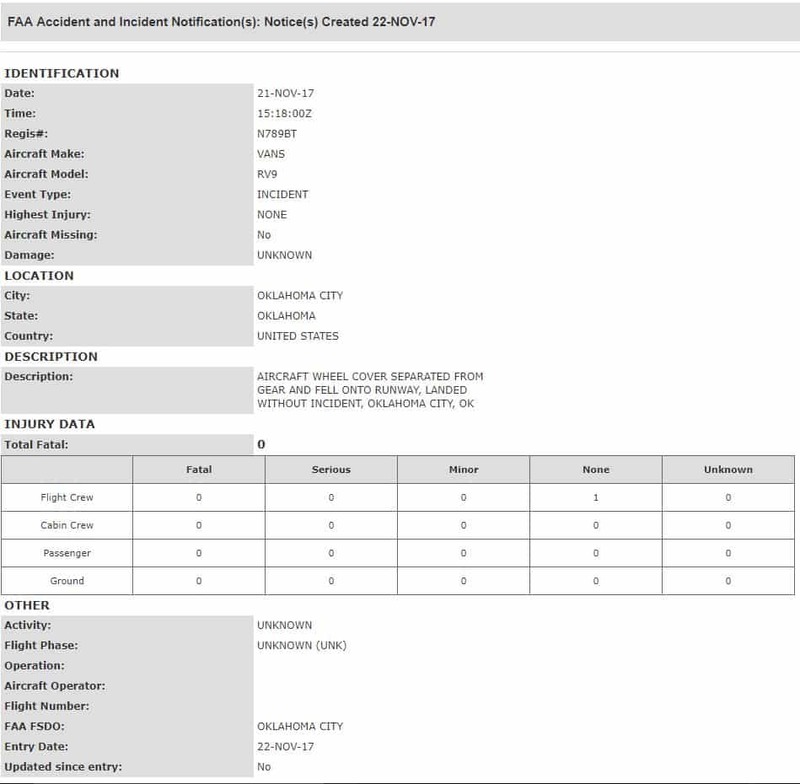 The University of North Dakota’s John D. Odegard School of Aerospace Sciences asked whether FAA Order 2150.3B would be applicable in its existing form to operations under part 107 and if so, whether the sanctions guideline ranges described in that publication are appropriate for violations of part 107. 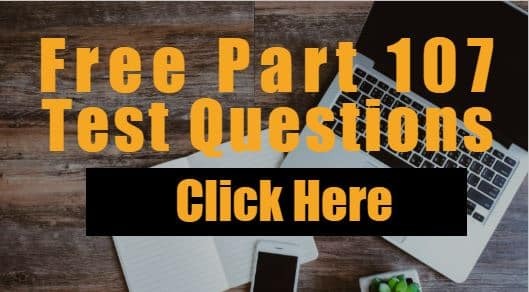 Subpart C of 14 CFR part 13 specifies the penalties that the FAA may impose in response to a regulatory violation. To provide further clarity, the FAA has amended § 107.5 with a list of potential sanctions that could be imposed in response to a violation of § 107.5. Those sanctions may, among other things, include a civil penalty or certificate action. The FAA has also issued generally applicable guidance on sanctions that may be imposed for regulatory violations, which can be found in FAA Order 2150.3B. The FAA is currently considering whether Order 2150.3B addresses UAS-specific considerations that may arise in enforcement actions under part 107, and the agency may revise this order, as appropriate, to reflect this consideration. Interested in integrating drones into your railroad company or service provider company? This video is designed specifically for you. It will cover: (1) where we currently are with the law, (2) where we are going, (3) railroad specific use cases and their problems, (4) important questions that need answering regarding integrating drones into companies, (5) a helpful solution for your company to “get a grasp” on how your company should position itself regarding drone integration (since many companies are having a hard time trying to figure out “what they should do”), and (6) words of warning. Want to hire me to be a speaker at your event or to give your company a presentation? Subscribe to the newsletter and we'll send you the presentation slides. Please fill out this survey to tell me which ones you are interested in so I can create them as soon as possible. Want to know when new courses come out? We're in the process of creating courses. Sign up for the newsletter below and we'll notify you when courses become available. If you are already subscribed to the newsletter, type in your email here and you'll be tagged to receive future announcements. • How to do Public aircraft operations, public COA, ACOA, etc. • How to apply for a public COA. • Safety Risk Management for Drones (Hazard Identification, mitigations, etc.). I did an interview with Poms and Associates. In the interview, I discussed the types of insurance and why a drone operator would need insurance. I wanted to add a few points on the “Disruptive Regulation, or ‘Mother May I?’” section of the recent Forbe’s article Drone Disruption: The Stakes, The Players, And The Opportunities. Much of the focus of the VC money is on the technology with very little being put into regulatory R & D and interacting with the already existing regulatory structure. Great. People start thinking about lobbying to get around the regulatory problems by getting Congress to give the FAA a special type of legal authority, but once again, we are back at the regulatory R & D point because that new special authority is going to have to assimilate and interact with all the other provisions of the already existing regulatory structure. On top of the lack of VC money going into the legal R & D area, many of the large companies are being represented by lawyers dabbling in the drone law who are not qualified. One great example is where one law firm wrote an exemption for their client for a pixhawk flight controller, not an aircraft. Let that sink in for a second. You get exemptions for aircraft, not exemptions for parts of an aircraft, which showed the inferior drone 101 knowledge of that firm. That firm later picked up a multi-billion dollar massive global company as their client for another 333 exemption. Another example is of legal malpractice where a different lawyer at a different law firm negligently didn’t complete certain paperwork for their client’s exemption and the exemption was denied, which put the client in a bind because the client could not legally operate their drone commercially for months and months until approval. That attorney is now trying to work with other large companies. There is also a lot of flux in the law and the FAA guidance. The FAA is relying on their “guidance,” not law, and when they do use regulations, it is because they arbitrarily “activated” regulations that had not historically been applied to drones. Basically, everyone is violating a regulation when they fly their drone. Even flying according to their own guidance documents alone is not compatible with the regulations! The FAA uses this to make you comply with their guidance, because if you don’t, they come after you for violating the regulations, not guidance. Currently there is a lawsuit going on in the D.C. Circuit Court of Appeals (the court right below the U.S. Supreme Court) challenging the FAA’s drone registration regulations. My firm is assisting John Taylor, the Plaintiff. Basically, the FAA went too quickly and did not do all they were legally required to do to create the registration regulations. On top of that, they also “activated” some registration regulations that had not been historically applied to drones. There is a chance those regulations with be thrown out by the D.C. Circuit Court of Appeals because they were illegally created – which is going to cause things to slow down because the FAA will make sure all their ducks are in a row. The court ruled in favor of John Taylor and the regulations were declared illegal; however, Congress passed the National Defense Authorization Act of 2017 which basically overruled the Taylor ruling so the registration regulations are back in effect. A more detailed analysis of the legal problems with the drone registration regulations is here. This is going to be interesting in how this all plays out since the FAA is trying to get out the microdrone rule soon. It was reported that on Thursday morning a drone and a 1960’s Cessna 172 collided in the air over Costa Rica. It is alleged that the Cessna hit the drone with its right wing strut. This is NOT the wing but the strut supporting the wing. The result was chipped paint on the strut. Superficially, it looks like most of other struts I observed when I was regularly out on the flight line as a flight instructor. If you are wondering why it is normal to see paint chipping, this is because rocks sometimes get blown up during the run-up process of airplanes and hit the aircraft. In the United States, recreational drone flyers should stay below 400 feet above the ground. It is better to stay as low as you can because agriculture pilots and helicopter pilots sometimes fly very low sometimes, almost sneaking up on drone pilots who do not have enough time to react. I compiled a list of FAA guidance documents regarding recreational flyers, excluding 91-57A, in one of the chapters of my book Drones: Their Many Civilian Uses and the U.S. Laws Surrounding Them. Now all you recreational flyers out there calm down. I know many anti-drone folks will use this as a perfect example to say that drones should be heavily regulated before “they take down an airliner,” but I think this is a perfect reminder of how much we need to educate new flyers on how to operate safely. Unfortunately, as I explained in a previous blog post, the FAA is currently not allowing commercial drone flight instruction under a public COA or a section 333 exemption. We as recreational flyers should attempt to pick up the safety slack promote safety while we still have freedom to fly. Before we jump to conclusions and fault the recreational drone flyers, let’s ask some questions. How do you know that the pilot was paying attention? There are many accidents that have been caused by the pilots not paying attention. It is a two way street for both parties to see and avoid other aircraft. How do we know that it was the drone operator flying the drone higher than he should have and not a fly away? Could the drone been manufactured incorrectly? Was there some type of GPS interference? How do we know it was a drone? The internet was freaking out that a drone collided with an aircraft but it later turned out to be a bird. Do we have any evidence there was a collision with a drone other than some chipped paint and a pilot’s testimony? Do we have a drone wreck or pieces of the drone? We need to investigate further and only make determinations when there are hard facts, not just chipped paint and a story. Here are my thoughts and opinions. This question has multiple issues but the big ones are (1) FBI being compliant with what the FAA says, (2) the FBI being compliant with what the DOJ says, (3) was there a search for 4th Amendment purposes, and (4) are there any state laws that require a warrant for this type of activity? The FAA and DOJ have issued guidance on this area. The FBI is a government agency and such they are only required to comply with certain parts of the regulations. They do not have eyeballs on board the drone so they must seek a waiver to comply with the regulations (specifically the “see and avoid” requirement in Part 91). The FBI applies to the FAA to obtain a Certificate of Waiver. The FAA will give them a COA and they will have to operate under the restrictions given. The DOJ and President Obama have issued guidance regarding the use of drones. The Presidential memo addresses the DOJ use of drones and privacy rights. https://www.whitehouse.gov/the-press-office/2015/02/15/presidential-memorandum-promoting-economic-competitiveness-while-safegua Also, the DOJ issued guidance for the FBI which is located here. http://www.justice.gov/file/441266/download There would need to be some more investigation to find out if the drone use was in compliance with those two documents and whether any violation would likely change anything. Lastly, was there a search that violated the 4th Amendment? This area needs to be analyzed under the plain view doctrine and also under Kyllo which discussed FLIR technology and the 4th Amendment. You should see the case of Florida v. Riley which is a US Supreme Court case which held that a police helicopter at 400ft had a lawful right to be where it was and observe the marijuana. If the FBI drone has a COA and they were at an altitude lawful under the regulations, they had a right to be there observing whatever they wanted to observe. The next question would be was the use of a FLIR camera a “search” under the 4th Amendment even though the drone is in a lawful place? Fast forward to today where they have handheld FLIR cameras for your iPhone for $150! http://www.amazon.com/FLIR-ONE-Thermal-Imager-iPhone/dp/B00K0PXFB6 I think this case might be decided differently if it came up again because the expectation of privacy is currently diminishing in this area. Is there a state law requiring law enforcement to obtain a warrant before conducting this type of operation? Many states have started passing laws in this area requiring warrants. This creates the problem of the introduction of illegally obtained evidence, under state law, into a federal court for a criminal prosecution. This brings up all sorts of sub-issues.